The fire is crackling, the tree is lit, my kitchen smells of warm gingerbread, chocolate, and molasses. I’m having all the holiday feels. When I was little, around the holiday season, my mom used to make gingerbread cake for breakfast. She would never announce her plans to bake, instead, she’d let the spicy scents of ginger and warm, rich molasses seep under our bedroom doors, drawing us out and into the kitchen, dressed in our pajamas and cozy socks. Even though we knew Santa hadn’t yet come and our stocking weren’t filled, we felt like it was Christmas morning. We’d eat the gingerbread cake fresh out of the oven, drenched in butter, while we giggled together, and drank cold milk. It was truly the best of times, when all we needed to feel merry and bright was each other and cake. Sometimes the greatest gifts aren’t found under a tree, but in the moments that make memories, filled with love and family, and the traditions that remind you of home. These past few weeks in Jackson, WY have been cold (so cold) and snowy, just as the holiday season should be. Pajamas and cozy socks have been our family uniform, especially on lazy Sundays. I woke up this morning with the intention of making Kodiak Cakes chocolate chip muffins for breakfast; a healthy, whole grain treat my boys eagerly devour. As I was pulling ingredients from my cabinet, I saw molasses… ginger, cinnamon, nutmeg, cloves…and chocolate chips. I immediately looked down at my cozy socks and flannel pants, then over at the breakfast nook, soon to be filled with my three hungry boys. A smile came to my face, and I was 10 years old again. I shifted gears and prepared to bring some holiday magic into my kitchen. For the boys, and for me. Brought on by nostalgia, a sweet tooth, and Kodiak Cakes, I bring you Chocolate Chip Gingerbread Cupcakes with Molasses Buttercream. Please note, I don’t normally feed my family cake, or in this case, cupcakes, for breakfast. (That’s a lie, it happens more often than I should admit.) But ‘tis the season. In this particular case, I feel less guilty, given the base to these cupcakes is made from Kodiak Cakes Chocolate Chip Muffin Mix, which is filled with whole grains and 15 grams of protein. It may an be indulgent way to start the day, but a nutritional one as well, sure to bring giggles and build holiday memories. These cupcakes are rustic, hearty, delightfully spicy sweet, and filled with just the right amount of ginger snap. The chocolate chips add the perfect finish. Feel free to eat them unfrosted, they’re delicious. But if you’re like me and love frosting, this molasses buttercream is a tradition in itself. Preheat your oven to 350°F. Line a cupcake pan with paper liners. Set aside. In a large bowl, mix the Kodiak Cakes Chocolate Chip Muffin Mix, cinnamon, ginger, nutmeg, and cloves. Set aside. In another bowl, whisk together the eggs, molasses, oil, and whole milk. With a wooden spoon or rubber spatula, add the wet ingredients to the dry. Mix till combined. Fill each paper liner 2/3 full. I use an ice cream scooper to keep the cupcakes the same size. 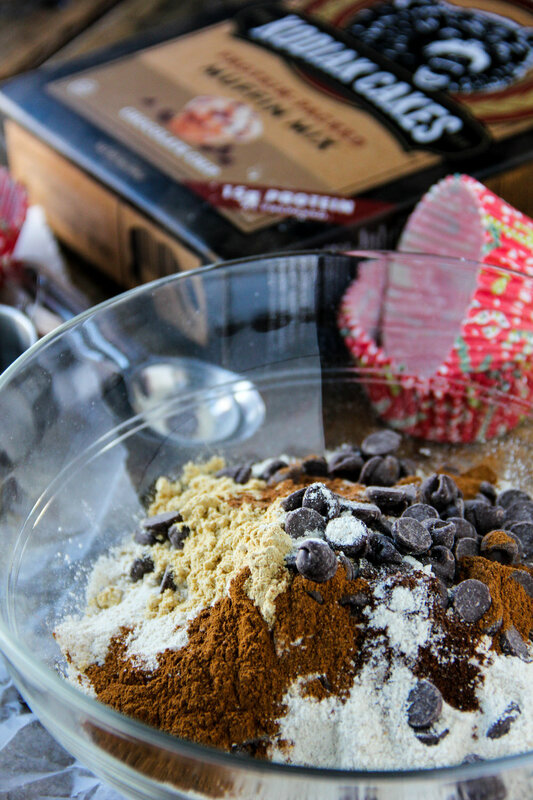 Sprinkle tops evenly with 1/2 cup of chocolate chips. Bake for about 15-18 minutes, till a center tester comes out clean. Allow the cupcakes to cool completely on a wire rack before frosting. In a bowl of an electric mixer, cream the butter on medium high speed for 2 to 3 minutes, till light and fluffy. Add the powdered sugar, 1 cup at a time, mixing well after each addition. Add the molasses, heavy cream, and pinch of salt. Mix on medium speed till combined. 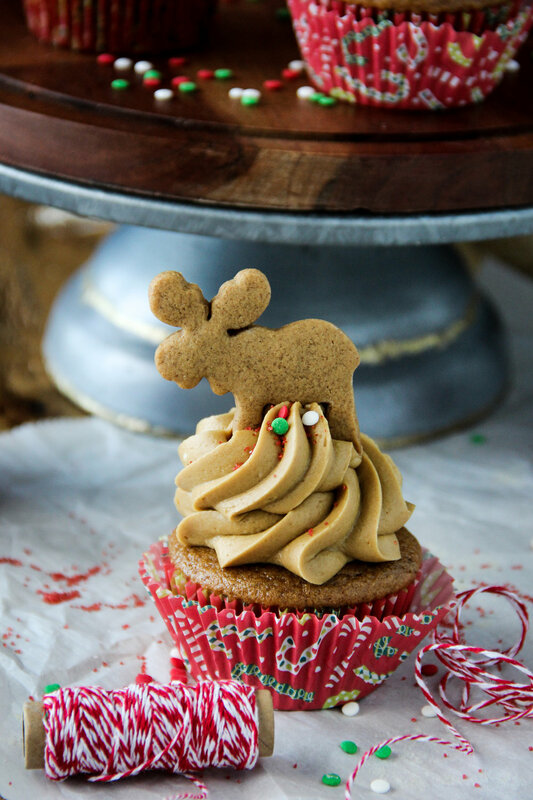 Frost each cupcake generously and top with a gingerbread cookie.